these cookies puffed up nicely and held their shape when using cookie cutters. Very buttery and not overly sweet. They tasted wonderful with just a bit of colored sugar sprinkled on top. I did add some cinnamon, nutmeg, and a tablespoon of molasses and used half white sugar and half brown sugar to one batch to make snicker-doodles and they turned out great. 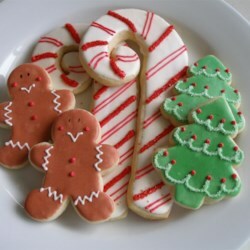 This is a wonderful sugar cookie recipe that can be used as base for many kinds of cookies. I am a professional pastry chef and have access to many recipes and this is one of the best I have come across.